If my friend Gina were here right now she would be rolling her eyes because she gave me this recipe and the original recipe most definitely does not contain these little green wedges known in these parts as zucchini. Gina lives in a no-zucchini zone in addition to a no-corn or no-bean-zone. Oh, they grow where she lives, but she just won’t eat them. Gina uses Italian sausage in place of the zucchini. While the soup is tasty that way, I am trying to eat more vegetables and less Wilburs (Charlotte’s Web reference in case you haven’t read children’s literature in a while) so I made the swap tonight. In the soup at serving time goes the “Cheesy Yum” – a combination of mozzarella cheese, ricotta cheese, and Parmesan cheese. Do NOT omit the Cheesy Yum! In fact, I was at school the other day and had taken a bowl of soup to eat at lunch. With horror I realized that I had forgotten my little blob of Cheesy Yum! Can you believe that the school office didn’t think that my Cheesy Yum Emergency was reason enough to let me go home? What kind of society are we living in? Cheese Barbarians! 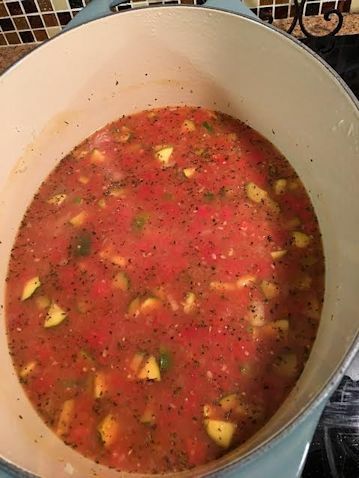 Give this soup a try! I have also made 1/2 the recipe and it was a great size for a family rather than a crowd. It freezes well, too. I freeze the Cheesy Yum in separate patties and then put one on top as I reheat the soup. Delicious! 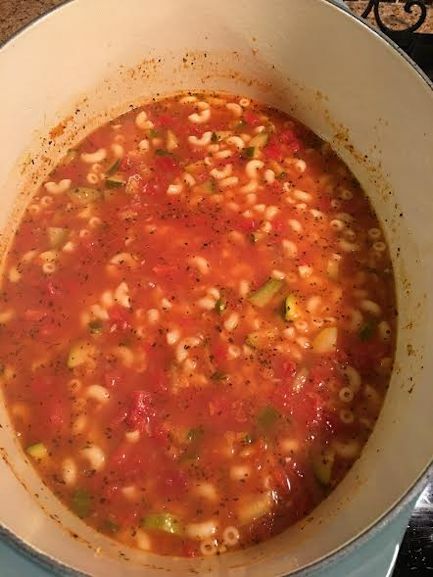 I would take a photo with the soup all garnished up and pretty but it is late and I am actually making this batch for my lunches and in about 5 minutes after I finish writing this post, the soup will go into individual containers and then go in the freezer. This is as pretty as it’s getting tonight! Heat olive oil in a large pot over medium heat. Add sausage, breaking up into bite sized pieces, and brown for about 5 minutes. 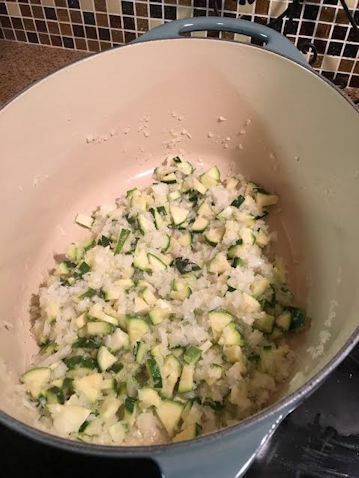 (Without the meat, I used one tablespoon olive oil to cook the onions and zucchini in although if you have a nonstick pan and are watching calories, you could possibly omit the oil.). Add onions and cook until softened, about 6 minutes. Add garlic, oregano, and basil. Cook for 1 minute. Add tomato paste and stir well to incorporate. Cook for 3 to 4 minutes. Add diced tomatoes, bay leaves, and chicken stock. Stir to combine. Bring to a boil and then reduce heat and simmer for 30 minutes. Cook the noodles separately, and then add to the soup mixture. Season to taste with salt and freshly ground black pepper. While the pasta is cooking, prepare the cheesy yum. 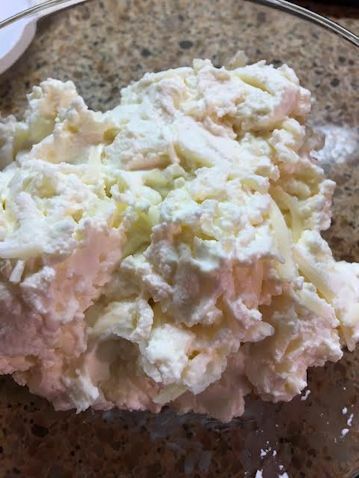 In a small bowl, combine the ricotta, Parmesan, and mozzarella. To serve, place a dollop of the cheesy yum in each soup bowl and ladle the hot soup over the cheese. Garnish with additional mozzarella and fresh basil, if desired. This soup is really good! Just made a double recipe and guess what? No zucchini, but lots of cheesy yum! One day I will sneak some zucchini in and you’ll never know….